Annex Planned To "Free Jumbo"
Now that real estate arrangements with the city have been completed, planning efforts are underway to "Free Jumbo" from the City Garage. This important step in our expansion will provide Jumbo with more convenient surroundings. While we appreciate the generous accommodations provided by Belleville's Bill Lugge and City Maintenance, we realize it is time to provide something closer to the museum. Mike Hutsch, leader of Jumbo's Keepers, said: "By displaying Jumbo at the museum, visitors will be able to see our largest, most famous artifact. 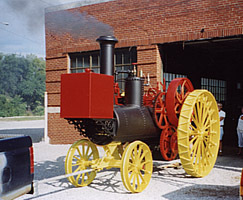 People ask about the steam engine all the time, so we need to take the next step in bringing Jumbo home." Plans include a structure that will allow both museum visitors and motorists to view this 1895 symbol of Belleville's manufacturing might. Jumbo's manufacturer, Harrison Machine Works, was founded in 1848, and operated in Belleville for over a century, turning out threshers and steam engines. Jumbo was owned by an Indiana farmer until 1930. 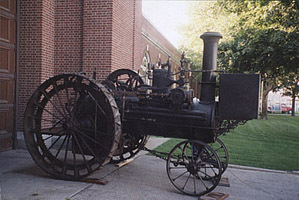 It was then acquired by the Ford Museum, where it was displayed until Jumbo's Keepers brought the machine back to Belleville in 2001. Watch for the kickoff of our "Free Jumbo" campaign to start this most important next step in preserving and promoting the history of labor and industry in Belleville. See more pictures of Jumbo on the "Jumbo" page.